Lethal Enforcers is a Super Nintendo game in the Action genre. The game was published by Konami and developed by Konami. The game has an ESRB Rating of M (Mature 17+) and was released on 1994-01-01. The game's official site can be found at www.konami.com. Lethal Enforcers was one of the few on-rail shooters for Super Nintendo and surprisingly, one of the most violent – Nintendo had to approve all of the games released for their systems – which is why it was so surprising given Nintendo's family-friendly image at the time. Back in the day, Konami shipped this game out with what they called the “Justifier” - basically their light gun for the game. This game allowed you to play as either Dirty Harry and/or Dirty Mary in one or two player action. The Justifier itself was a very good light gun, I preferred it much more than the bulky Super Scope Six that came out at about the same time. In the game, you take on thugs, gangsters, and robbers who “pop” out of cover - and it is your job to take them out. The game had digitized graphics so it was also more real than the typical “cartoon-like” games of the time. To make the game more challenging you also had to avoid hitting innocent bystanders and hostages. The music itself was very fast-paced and the sound effects fit the gameplay really well. 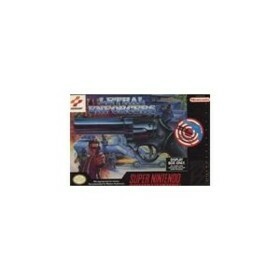 Overall, this was one of the more enjoyable light gun games for the Super Nintendo.